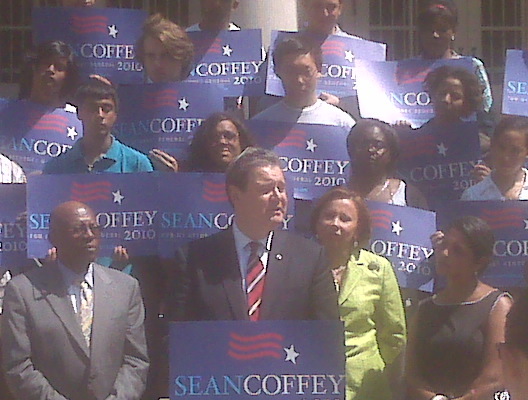 Hi gang- as you may know, tomorrow is Primary Day in New York State and I have a dear friend, Sean Coffey, who is running for Attorney General. Sean is brilliant, talented, reasonable and a former naval officer who has no ties to Albany…quite a plus these days! And the piece-de-resistance is that his wife Anne is a fabulous cook! What more is there! I think that New York would be very lucky to have him. In honor of Sean’s campaign and Election Day, I am printing a favorite Coffey family recipe- for what else, a New York style Coffey Cake! For the topping: Mix both sugars, cinnamon and salt in a medium bowl and whisk to blend. Add warm melted butter and stir to blend. Add flour and toss with a folk until moist clumps form. Set aside. For the cake: Position the rack in the center of the oven and pre-heat to 350. Butter a 13x9x2-inch glass baking dish. Sift flour, baking soda, baking powder and salt into a medium bowl. Using an electric mixer, beat room temperature butter in large bowl until smooth. Add sugar and beat until light and fluffy. Add eggs one at a time, beating until well blended after each addition. Add sour cream and vanilla and beat until just blended. Add flour mixture in 3 additions, beating until just incorporated after each addition. Transfer cake batter to a prepared baking dish and spread batter evenly with a spatula. Squeeze small handfuls of topping together to form small clumps. Drop topping clumps evenly over cake batter, covering completely (topping will be thick). Bake cake until tester comes out clean and topping is deep golden brown and slightly crisp, about 1 hour. Cool cake in dish on rack for at least 30 minutes before serving. Can be made a day ahead. Cool cake completely. Cover and let stand at room temperature. This entry was written by Caroline, posted on September 13, 2010 at 11:51 am, filed under baking, brunch, comfort food, entertaining. Bookmark the permalink. Follow any comments here with the RSS feed for this post. Post a comment or leave a trackback: Trackback URL.